Asiatic lilies (Lilium asiaticum) produce orange, red, yellow, pink or white flowers in mid- to late-summer. 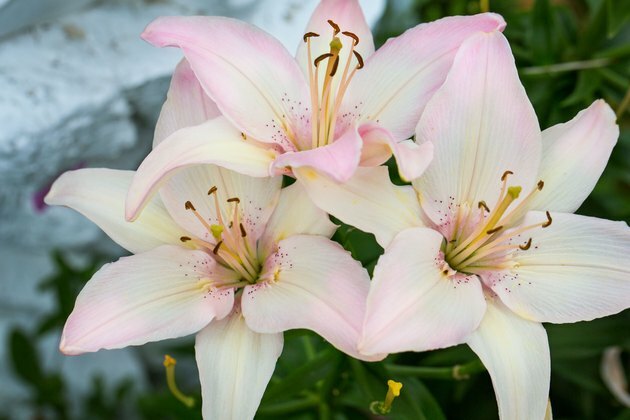 These lilies are perennial in U.S. Department of Agriculture plant hardiness zones 5 through 9, returning each year with fresh green foliage and clusters of new blooms. Once established, Asiatic lilies require little care and grow well with only basic maintenance. A garden bed with moderately rich soil that drains well and full to partial sun exposure works well for most Asiatic lily varieties. Adding compost to the soil before planting gives the soil better structure and some nutrients. 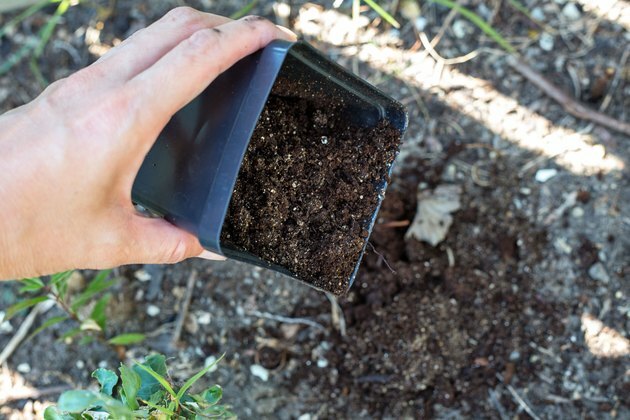 Work a 2- to 3-inch-thick layer of compost into the top 8 inches of soil. Avoid growing Asiatic lilies in wet soil or soil that drains poorly, or else the plants will suffer root rot. Asiatic lilies need consistent soil moisture to grow and flower well. 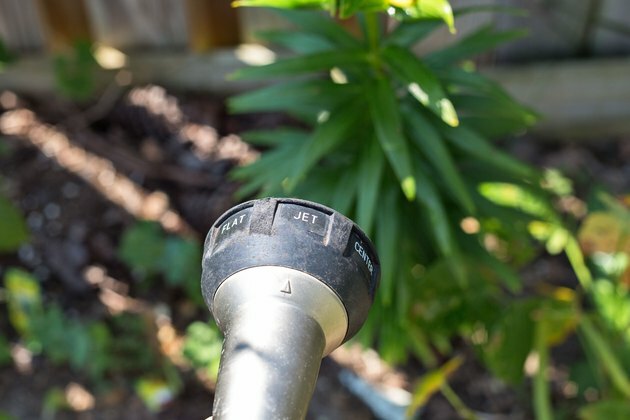 Water the plants' soil once weekly when the rainfall total was less than 1 inch the preceding week. Keeping the soil moist to a 6-inch depth provides sufficient moisture. Spread a 2- to 3-inch-thick layer of mulch over the garden soil each fall. The mulch slows moisture loss, keeps down weeds and provides winter insulation that protects the plants' roots. If you are in an area with freezing temperatures but minimal winter snowfall, increase the mulch depth to 6 inches and cover the dormant lilies completely. Remove one-half of the mulch's depth in spring after the lilies begin to emerge above soil. Pull back the mulch so it doesn't rest directly against the lilies' stems after they emerge. A single, annual feeding in spring, just as new growth emerges, provides Asiatic lilies with plenty of nutrients to flower well. 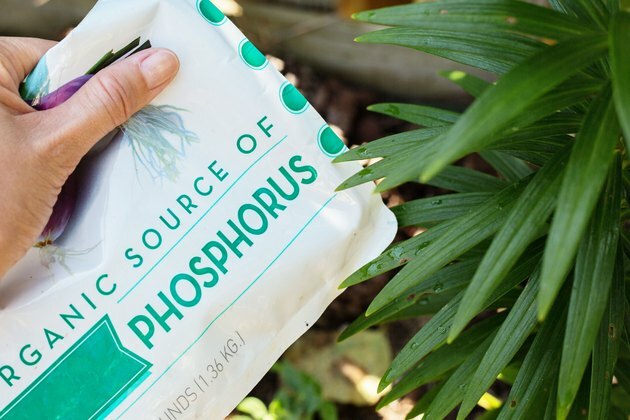 Use a high-phosphorus, low-nitrogen fertilizer at the fertilizer package's recommended rate. For example, sprinkle 1 tablespoon of a slow-release, granular, 9-18-9 fertilizer on each 1 square foot of soil surface of an inground garden, and water the site afterward. Avoid applying fertilizer directly on plant leaves because it can burn the foliage. Trimming off the spent flower heads prevents seed production, resulting in healthier plants. Remove the foliage only after it yellows and dies back naturally in late summer or fall. 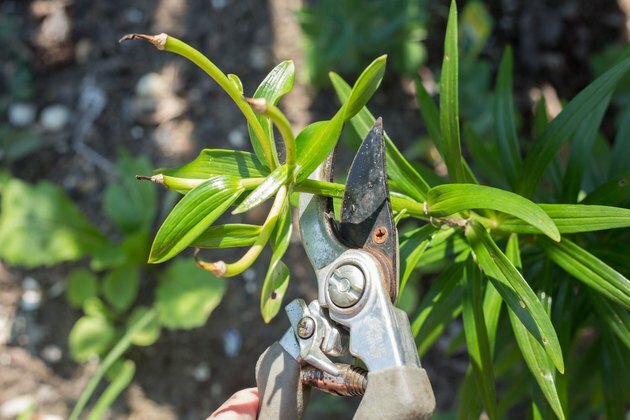 Before trimming, disinfect your pruning shears by wiping them with a rag that was soaked in isopropyl alcohol to prevent the spread of plant pests and diseases. Raking up and discarding the plant clippings also minimizes disease problems in the lily garden. Few insects bother Asiatic lilies, but fungal diseases can cause concerns. Lily mosaic virus has no cure and is spread by the feeding of small, pear-shaped insects called aphids. 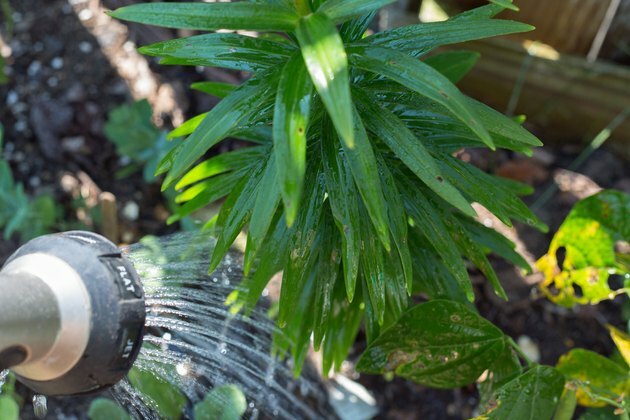 Spray the plants with a forceful jet of water to dislodge aphids if you notice them. Botrytis blight causes reddish-brown blotches on the foliage. Space the Asiatic lilies 8 to 12 inches apart for air circulation, and water their soil in the morning, keeping their foliage dry to prevent this disease. Pruning out infected foliage with disinfected shears helps prevent the disease from spreading. Gray mold and powdery mildew can grow on the foliage during cool, wet weather, but you can control it by using the same methods used for botrytis blight.